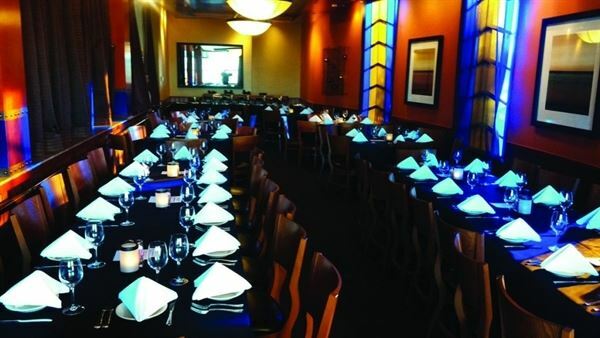 Our Chandler Arizona private dining room is the perfect venue to host an event! With our fresh flavorful and innovative cuisine you will be sure to find something for everyone. When cooking, our chefs envision fields of chiles, corn and vegetables, an ocean full of seafood, ranches of livestock, spices from around the world and cooking techniques unique to the culture in the region. Our unique décor in our restaurants is designed to suit small gatherings or large parties. Whether it’s for business or just for fun, Z’Tejas will make you next event a spectacular one. 2 Hour breakfast service includes fresh fruit, freshly baked muffins and all non-alcoholic beverages (except for bottled water and tea). Entree choices range from classic standards like Eggs Benedict and Biscuits & Gravy to southwest specialties like Pork Verde and Chorizo scrambled eggs. See our menu for complete details. Alcohol options are available. See attachment for banquet agreement and guidelines. Includes freshly baked cornbread, dessert and all non-alcoholic beverages (except for bottled water and tea). Add a Southwestern Caesar Salad or cup of Tortilla Soup for $3 PER GUEST Entrees range from our 'Z' Burger to Green Chile Barbacoa Enchiladas to Five Cheese Macaroni & Achiote Chicken. See our attached menu for all of our delicious entree choices. Alcohol options are available. Please see attachment for banquet guidelines & agreement. Appetizer Buffet. See menu for appetizer options. $14 PER GUEST Choose any three appetizers $16 PER GUEST Choose any four appetizers $18 PER GUEST Choose any five appetizers Enchilada Buffet - $23 Served with freshly baked corn bread, Southwestern Caesar Salad, seasonal rice, black beans and all non-alcoholic beverages (except for bottled water and tea). Fajita Buffet - $23 Served with freshly baked corn bread and all non-alcoholic beverages (except for bottled water and tea). Dinner Buffet I ($30) Served with freshly baked corn bread, Southwestern Caesar Salad, mashed potatoes, seasonal vegetables and all non-alcoholic beverages (except for bottled water and tea). Includes two passed Hors D'oeuvres (add $3 for each additional appetizer), Three entrees and a Dessert platter. See menu for complete appetizer and entree options. Dinner Buffet II ($34) As above but with four entrees and additional options. Various alcohol options are also available. Please see attachment for banquet guidelines and agreement. Includes freshly baked corn bread, Southwestern Caesar salad, one entrée and all non-alcoholic beverages (except for bottled water and tea). The Piestewa Menu ($23) features a variety of enchiladas plus Macaroni & Achiote Chicken and Grilled Cilantro Pesto-Rubbed Ruby Trout. The Superstition Menu ($28) features our Diablo Pasta, Chicken, Artichoke & Mushroom Stack, Miso Glazed Salmon and Baked Seafood Enchilada. You can also add our Peppercorn-crusted Filet for an additional $6 per person. The Shaw Butte Menu ($34) features Chorizo-stuffed Pork Tenderloin, Crispy Salmon, Peppercorn crusted Filet and Voo Doo Tuna. The Camelback Menu ($39) comes with both Miso Glazed Salmon and Peppercorn Crusted Filet. For Dessert we offer our famous Ancho Fudge Pie with walnuts, pecans and a pinch of ancho chile to bring out the rich chocolate flavor, served warm with whipped cream. (Add $5.50 per guest) See our menu for complete menu and details. Alcohol options are also available.